This review is long overdue. It also worked out a little longer than I had initially intended, but here it is nonetheless. It is disappointingly rare to see a psychologist making a genuine attempt at answering a question that is fundamental to the discipline. As an endeavour, Psychology is fragmented, a complex set of balkanised territories within which researchers tend to maintain a relatively parochial mindset. There are historical and practical reasons for this fact, but the resultant effects on the development of theory are deeply regrettable. 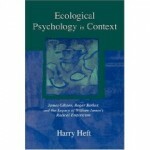 Running against such standard practice in Ecological Psychology in Context Harry Heft draws on a rich heritage of theory from William James forward in order to tackle no less a question that the nature of the psychological environment. More impressive than the fact that he attempts such an undertaking in the first place is the level of success he achieves, offering a framework that provides a unified way of considering the environment from the physical to the social and cultural that is continuously grounded in the experience of the individual agent. In doing so, Heft provides the ground for a more coherent Psychology, and I suggest an approach that can provide a solid foundation for an enactive Psychology. Heft’s aim in the book is in fact two-fold. On the one hand is an historical thesis – that the ecological psychologies of James J. Gibson and Roger Barker are direct descendents of the later work of William James, specifically his radical empiricism. On the other is the broader theoretical consideration of the psychological environment. The historical thesis is interesting its own right, though is more strongly defended in the case of Gibson than Barker, whose relationship with James’s work seems diluted by the influence of the Gestalt school. While the Gestaltists were a strong influence on Gibson also, in his case a single degree of separation lies between him and James, in the form of his too-overlooked doctoral supervisor, Edwin Holt. Heft spends some time detailing Holt’s life and work in a laudable attempt to raise the profile of a man whose influence on Psychology is deeply felt but largely unheard of (he supervised the doctorates of both J.J. Gibson and Edward Tolman, two individuals who make the cut in most undergraduate degree courses). Heft laments the lack of awareness of Holt’s work, the manner in which he was treated by the academic establishment of his day and the way in which that undoubtedly diminished his contribution. Through Holt, James’s radical empiricism provided a perspective on the mind, perception and the relationship between an observer and their environment that helped give Gibson the rare and productive insight for which he is remembered. In undergraduate Psychology courses James’s work is often described as occurring in two periods – an early psychological period and a later philosophical one. Interest for psychologists largely culminates in his Principles of Psychology with his subsequent work largely dismissed as James becoming concerned with less practical questions (I remember my first year History of Psychology course being taught in just such a fashion). James’s later work, though, was an attempt to lay a solid foundation for empirical science, one that takes as its ground the only thing of which we have direct awareness – experience. The origins of all knowledge – entities and their relations – are to be found in immediate experience. James did not begin with perceiver and object as discontinuous entities, but with undifferentiated experience; and relations, including the relation between knower and known, are part of immediate experience. This is his philosophy of radical empiricism. [I]t is “I” who is moving through the environment. This is not a Cartesian experience of the “I”, a disembodied entity that is self-aware as it thinks. This “I” is much more concrete than that. It is the source of action and it can literally be seen by the perceiver. It is “I” as purposive agent. With an emphasis on the interaction between the agent and their environment Gibson is committed to an unmediate, direct perception of that environment. But this direct perception is not a bald writing of the world into the cognitive system. It is direct but not unconstrained or unshaped by the nature of the perceiver. And so we come to a concept utterly central to ecological theories of perception, affordances. Affordances, which have been almost entirely absent from writings on enactive cognitive science, are tricky. [A]n affordance is neither an objective property nor a subjective property; or it is both if you like. An affordance cuts across the dichotomy of subjective-objective and helps us to understand is inadequacy. It is equally a fact of the environment and a fact of behavior. It is both physical and psychical, yet neither. An affordance points both ways, to the environment and to the observer. He could certainly have a been a little bit more clear, but what is obvious is that he is as dissatisfied with the old dichotomies of subjective and objective as anyone working within the enactive approach, and in search of a practical account of perception that avoids such muddled thinking. Of course, just how affordances should be considered has been problematic since Gibson introduced the term, but given their centrality to an ecological account of the psychological environment Heft gives them plenty of attention and through them develops more fully the second aspect of the book – a general theory of the psychological environment. Within ecological psychology the environment is described not as a set of facts that are given and universal, but rather as a set of relations in which the psychological subject is embedded – that is, your description of the psychological environment must be made with the person (or agent) at the centre, the world described as a set of relations involving them. This means that the person partly constitutes their environment, and every time the relations between them and the world change, the environment changes. Those changes can thus be evoked equally by alteration in the world or alteration in the individual. The sharp distinction we might like to draw between an agent and their environment isn’t there to made. This undermines other ways of describing psychology that require the kind of distinction between stimulus and response that has characterised behaviourism, the cognitive psychology that replaced it and that was so systematically (if not sufficiently famously) demolished as a firm ground for theory by John Dewey in 1986. The environment is largely a tangle of affordances, then, but without a more worked out theory of affordances that doesn’t get us very far. Heft obliges in two ways, firstly by detailing a concept of affordances that tames the confusion about them and extends the domain in which we might use the idea, and secondly by then tying them into the behaviour setting theory developed as “ecological psychology” by Roger Barker and his colleagues. Briefly, Heft points out that affordances, being relations that enable particular forms of action by and agent, are at once dependent on the subject and yet independent of them. Affordances are classically body-scale dependent (something affords my stepping up onto it only if the relation between my leg length and the height of the object is appropriate, for instance). Heft points out that they are also developmentally dependent and, more crucially, skill-dependent. Over developmental time the affordances the same object offers will change (they may also change with my health, for example), but affordances will also change with my capabilities. Written English affords reading for me know, but Cyrillic writing does not. The environment is thus partly determined by the subject, but not entirely so. Even if I have not noticed that a particular object affords me stepping on it, it is still a reliable fact that I could step onto it. It is in this way that affordances ignore the traditional subjective-objective distinction. The inclusion of skill and the development of an intentional theory of affordances plays an important part in avoiding Heft’s view from being compartmentalised, segregated from theories of “real cognition”. The perception and actions involved here are complex and richly laden with meaning for the psychological subject. That complexity is not added after the fact, but is part and parcel of the direct relationship between subject and world described in affordances. This more expansive view of affordances is thus ripe for synthesis with Barker’s concept of behaviour settings. Barker’s (1968) theory is not well known, and I could not possibly hope to do justice to it in just a couple of hundred words here, but I will try to highlight the salient relevant points for our present purposes. Through the 1950s and 1960s, well into the 1970s, Barker and his colleagues conducted a mind-bogglingly comprehensive series of studies of the natural behaviours of the population (initially just the children) of a small rural town in the United States referred to by them as Midwest. What the team were attempting to do was observe real behaviours in their natural contexts, in the hope of gaining a more general insight into the relationship between environment and behaviour. This extensive set of observations was prompted by what Barker refers to as a “negative epiphany” – he realised one day on a long train journey that he was one of the leading experts on frustrated behaviour in children but could say almost nothing about under what conditions children typically got frustrated. He had no baseline data. He and his colleagues rectified the problem, and in doing so came to some staggering insights concerning the relationships between physical and social contexts (what Barker refers to as “behaviour settings”) and people’s actions. Put simply, different social and physical settings afford certain actions, and tend to inhibit or suppress other forms of action. At church, people “behave church”, in the drug store, people “behave drug store”. Behaviour settings are frequently carefully constructed over long historical periods and designed to organise activities. Barker uses the delightful analogy to standing waves in physics. Some situations have associated “standing behaviours”. The “affordances” in question here are somewhat different to the Gibsonian model. They concern not specific bodily movements but rather molar actions – a classroom affords holding a class, not just standing or sitting in particular orientations. What is more, as a person becomes inducted in the use of behaviour settings then situation roles and associated actions are structured by the setting, to such an extent that the behaviour of the people present is better predicted by their presence in the setting than by any specific learning history of the individual person. A society meeting demands a chairperson, and if the regular chair is not present then the structure of the behaviour setting will produce one, even if that person has never chaired a meeting before. If you want to predict and explain people’s behaviours, their context rather than their individual learning histories are your best guide. Heft’s theory goes into some depth on behaviour settings. How they should be conceived, what kinds of structures they tend to have, the form and importance of different roles and the relationship with the physical setting, all of which we must ellide here. Our focus is on the generic concept of collection behaviour afforded by a given situation, unfortunately termed by Barker “behaviour-milieu synomorphs”. Heft points out that in a purely Gibsonian view then behaviour-milieu synomorphs and affordances are quite separate – the former explicitly and only relating the available collective actions of a group, the latter specifically about the behaviours available to the individual. Heft argues that this distinction is too stark, however. When the concepts of skills and social interaction are considered, then affordances are not simply structured by individual action but social norms and practices. To give a simplistic example, a menu in a restaurant affords my ordering particular meals, but only when structured within the wider domain of social and conventional norms. On the other hand, behaviour-milieu synomorphs are defined at the level of collective activities, but this doesn’t give us the kind of traction at the level of individual behaviour that we might like. A restaurant affords enjoying a meal with others, but Barker’s theory does not allow us to characterise the behaviour-milieu synomorphs of a given setting in much more detail than that. We can predict molar behaviours, social roles and likely patterns of action, but the specific predictions of behaviours of individuals is limited. A more developed science of affordances that explains and runs the range from the individual behavioural affordance to the socially structured (and structuring) behaviour-milieu synomorph would offer us a unified theory of the psychological environment. Such a theory has a lot to offer, and Heft goes on to suggest that a theory (combined with other elements I haven’t discussed here, such as a general theory of tools and artefacts) could form the foundation of a theory of meaning. Though he does not explicitly engage with the enactive literature, Heft’s extension of ecological psychology, his synthesis of the individual and collective and his grounding it all in James’s radical empiricism (everything begins in experience), he has effectively united the two streams of research. As a source of theoretical tools, developed concepts and an introduction to the extant resources of ecological psychology the book deserves a place on the shelf of any enactivist seriously interested in how the approach can be applied in domains of normal human experience – the area so commonly (and wrongly) considered “higher cognition”, from which enactive theories have to date been barred. Harry Heft will be a speaker at the Enaction Summer School this year, and I am eagerly looking forward to see the meeting of ecological and enactive. Barker, R. (1968). Ecological psychology. Stanford: Stanford University Press. Gibson, J.J. (1979). The ecological approach to visual perception. Boston: Houghton-Mifflin. Heft, H. (2001). Ecological Psychology in Context: James Gibson, Roger Barker, and the Legacy of William James’s Radical Empiricism. London: Lawrence Erlbaum Associates. Cognitive development in Zurich Perceptual Modalities: The Overlooked Ecological Viewpoint.